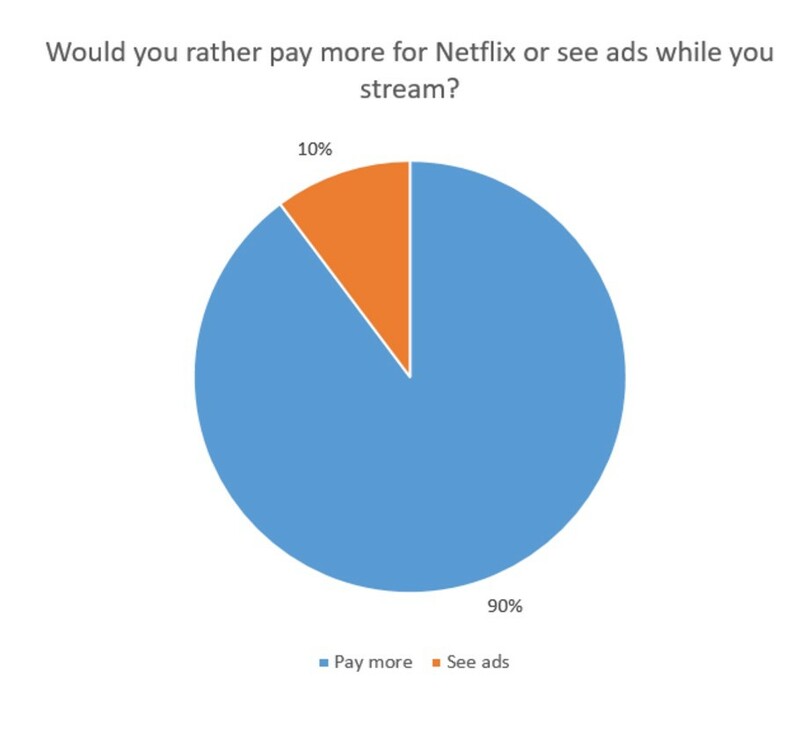 A survey of 1,200 Netflix subscribers shows that an impressive 90 percent of them prefer to pay more for the service rather than put up with advertising. Asked how much more, most customers talked in terms of a few dollars, but a quarter said they were prepared to pay more than four dollars to avoid advertisements, while some even said they would cancel their subscription to the service rather than have advertising. Despite the limited validity of the survey, carried out at Reddit and thus subjected to a strong sample bias, the conclusions would seem to reflect a growing trend whereby advertising becomes a deal breaker. The spread of ad-blockers, which has already prompted some publications such as Forbes, to try blocking the blockers, illustrates how tired many people are of advertising. he is avoiding a key factor: Atresmedia isn’t giving us anything for nothing. We pay dearly with our attention and time, as well as — considering how dreadful some advertising formats are nowadays — our patience. The idea that content is free when paid for by advertising is a fallacy: our time is also worth money, and more and more of us are deciding not waste out time. The approach of the Carlottis of this world that because we don’t pay money for something we have to put up with whatever garbage we find on our television screens is no longer acceptable. The growing popularity of Netflix, despite its progressively reduced catalogue due to increased competition, shows that people want to watch their favorite programs uninterrupted, even if the ads put in front of them are based on segmentation, and supposedly of interest. I’m not saying that advertising is about to disappear for ever or that we will have to pay for everything that comes without advertising, but everything suggests that more and more of us are prepared to pay to watch their favorite programs in peace. Which doesn’t mean that some of us won’t be prepared to pay, or that some people would never pay, in the same way that there will always be content worth paying for and other content that nobody would watch even if it were free. As things stand, if I see that Antena 3 is going to show a decent film, my inclination is not to sit down to watch it, but to check whether it’s on the Netflix or Yomvi catalogue (two subscription services I religiously pay for), and if not, then I’ll record it and skip the ads. I’m guessing that large numbers of people do the same. I’m not sure where this new flexibility on the part of viewers has come from, and that has made more and more of us prepared to pay so avoid advertising rather than get something for “free”. The internet has certainly changed our consumption habits. The question now is whether the television and entertainment industries are paying attention to those changing habits, or are going to keep trying to do things as they have for the last half century or more.